PeachDish ~ 2 Meal Box: Mahi Mahi w/ Coconut Rice & Chateau Wings with Sweet Potatoes and Onions! Hi all! 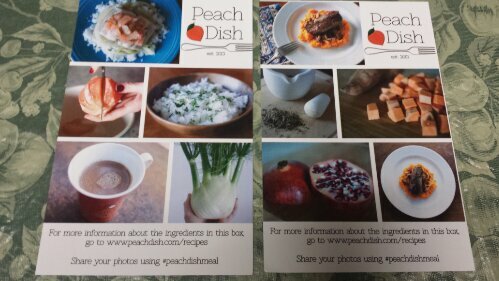 So a few months ago, right when PeachDish surfaced in the world of subscription boxes, I reviewed one of their single-meal fresh food cooking boxes (see here). While I loved the menu, there were a few items that needed some tweaking before I was 100% sold. And so, when they offered to send me another box, I was more than happy to do the review as I wanted to 1. see the changes made and 2. cook and eat delicious food! Since my original review, they have re-vamped a LOT with their menus, packaging, and more. 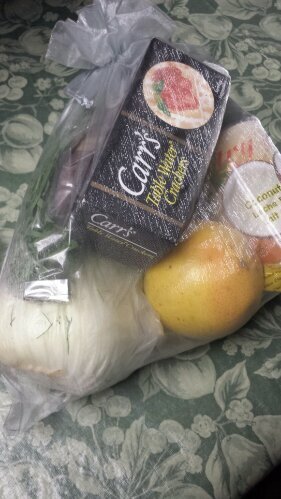 Now, their packaging is more attractive, each ingredient sealed well and the items for dinner #1 separated from #2 in a gift-bag style drawstring bag. Plus, the meat and fish arrived cold, making me feel completely safe in terms of cooking and consuming it (perhaps the cool winter weather helped as well). Finally, I was impressed with their menus, and the combinations that they created, which I probably would not have though of on my own. 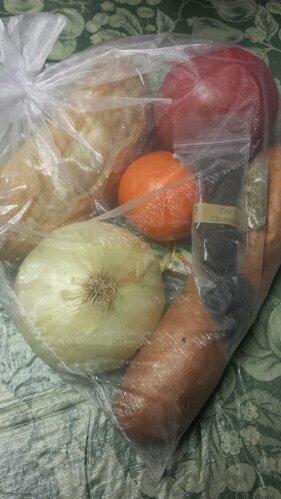 And so, for those of you who don’t know how it works: this gigantic brown box arrived at my house on a Thursday afternoon full of ALL the ingredients needed to made 2 complete meals for 2 people, with the exclusion of simple ingredients almost every house-hold has like olive oil, salt and pepper. 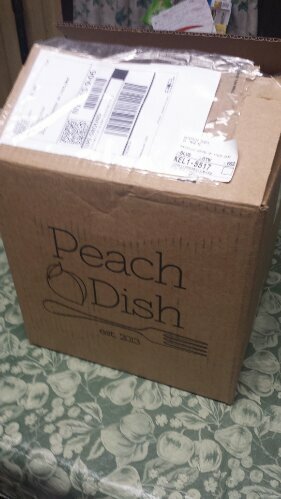 Each PeachDish box contains 2 dinners (made for 2 people and often containing more than 1 course, like an appetizer or dessert) runs at $50 per box and takes some stress out of food shopping. P.S. 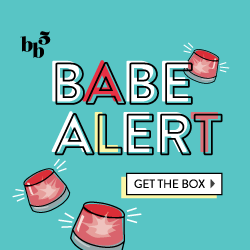 Continue reading to find out how to get your first box for $15 off! All nation-wide deliveries occur via 2-day shipping and aim to arrive on a Thursday unless you live in Atlanta, which you would get on Wednesday, as it is shipped out fresh and sealed on Tuesday. 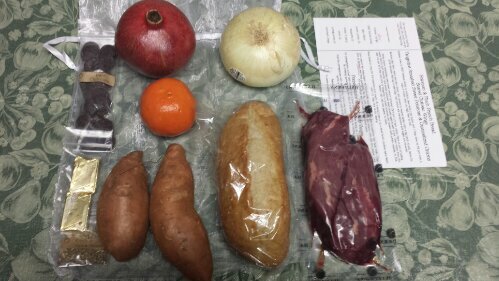 Since it’s shipped with fresh, raw food, the inside of the box is lined with refrigeration packaging, some extra packaging wrapped around all of the items, and a frozen ice pack surrounding the meat and fish as well (as seen above). For more details on shipping or how it works, click here. 1. Grapefruit & Tarragon Mahi-Mahi with Braised Fennel & Coconut Rice w/ a starter of Crackers with Goat Cheese, and a Dessert Drink of Coconut Milk Hot Chocolate. 2. Seared Chateau Wings with Tangerine Smashed Sweet Potatoes & Caramelized Onions, with a surprise dessert which ended up being Pomegranate Seeds with Dark Chocolate Drops. To make it easier, I’ll explain each on their own! First we have the Mahi-Mahi meal! They included an information card with not only the recipes but also some pictures of the ingredients and how the final meals should look. 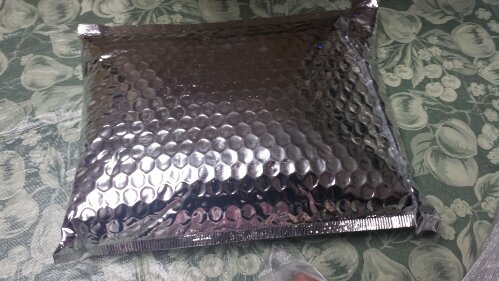 Like mentioned before, everything was wrapped up nicely and easy to figure out. I threw the fish into the refrigerator while I began to prep the other ingredients. I definitely recommend reading through the entire recipe first, because you may need to boil water or pre-heat an oven and it isn’t always the first step. I actually jumped around with the recipe to make sure everything would be cooked and hot all at the same time. I laid out all of the items to give you a look at everything included! I really love how they don’t skimp with the items, like including a full block of spiced goat cheese and box of crackers, and extra Tarragon and that giant fennel! So, my first step was cooking the rice and fennel! 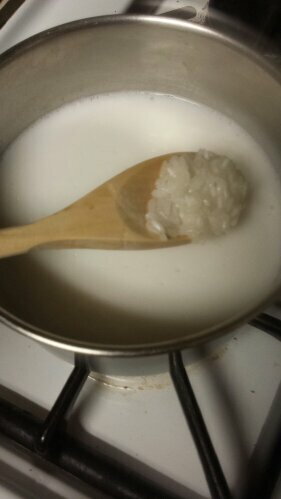 I brought the desired amount of rice, water and coconut milk up to a boil, and then reduced the heat so it would simmer. In the meantime, I chopped up the heart/bulb of the fennel into slices and brought another pot of water up to a boil. I then added in the bouillon cube and fennel and let it simmer on medium heat for about 20 minutes. The rice actually cooked really fast and so I had to let it sit and stay warm while I finished the fennel and the cooked the fish. I heated up a pan to cook the Mahi-Mahi on, and actually used coconut oil instead of olive oil (to keep with the coconutty-island flavor theme). I threw the mahi-mahi onto the heated pan, seasoned with salt and pepper, and flipped after a few minutes. In the meantime, I segmented the grapefruit (which is a bit messy- beware!) and cut up some tarragon to make the ‘salad’ for the top of the fish. While that all finished cooking, I prepared my appetizer! This super quick and easy appetizer was also in my previous box. 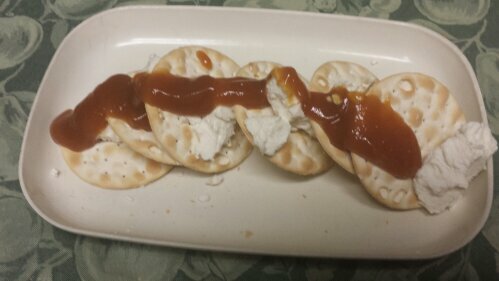 I really like mixing flavors like sweet and spicy, or salty and chocolately, and so I decided to add some peach butter (from my fridge) to my Carr Crackers and Spiced Goat Cheese. It was the perfect addition for me, but they even were good as is. Finally, all of the food was ready! 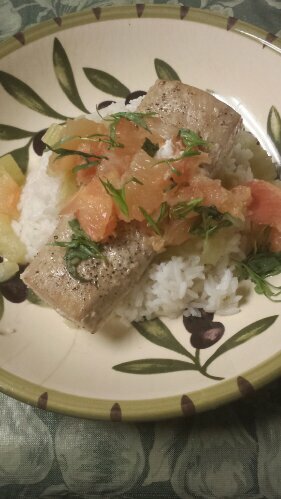 I layered the coconut rice on the bottom, covered by the braised fennel, topped with the lightly seasoned Mahi-Mahi and finally, the grapefruit-tarragon salad! In general, I HATE raw fennel… at first I was a little disappointed when I received it due to that intense licorice flavor, however I learned that when you cook fennel, the taste changes completely. It became soft in texture and actually savory, which paired very well with the fish-rice combo. The coconut rice opened a totally new door for me.. I’m almost positive I’m going to start cooking my white rice this way from now on as it brings so much more flavor with one simple extra ingredient. 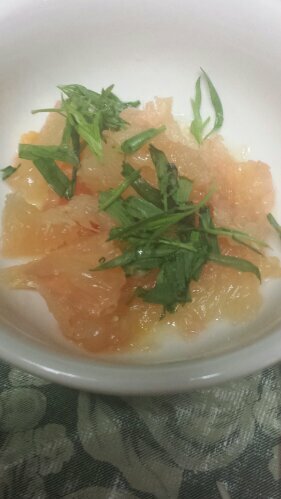 The grapefruit-tarragon salad was good as well. but a bit too bitter in my opinion. I would have added honey and let it sit in the fridge for 15 minutes, or possibly pair with an orange-lime citrus salad. Finally, the mahi-mahi was good, but could have been flawless with an extra ‘oomph’. Salt and pepper wasn’t enough for my taste buds, and I would have added some dill, or honey-mustard sauce, or even a soy sauce mixture either for marinating or while cooking. 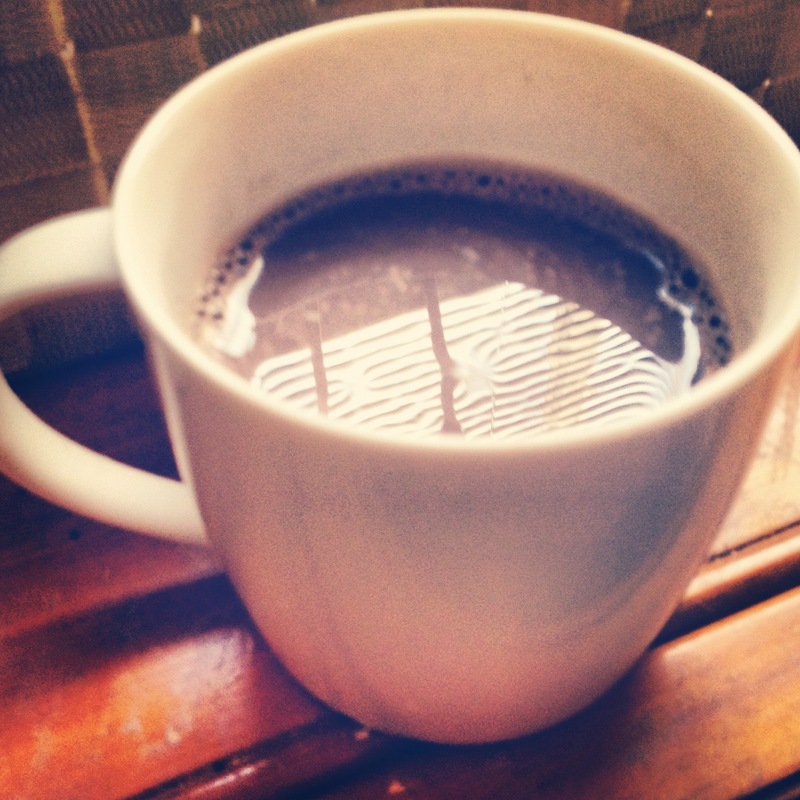 I actually ended up making the Coconut Milk Hot Chocolate at a friends house and so I nabbed a picture that looked similar to it. I heated up the coconut milk (what was left unused from the rice) along with brown sugar and cocoa powder, stirring occasionally so it didn’t boil or curdle. Then I topped it with some marshmallows and ‘cheers’-ed with my friend! It was a great ending to the meal. 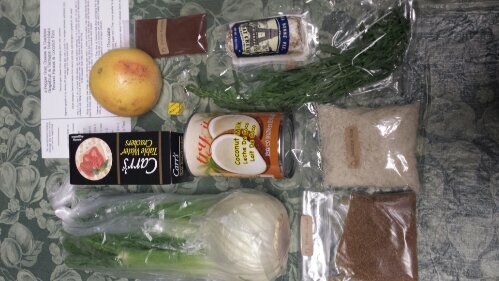 All in all, this PeachDish meal opened me up to a new flavor of fennel and awesome way to cook rice! I think I would swap the grapefruit salad for something less sour/tangy, and season the mahi-mahi with either more herbs or a sauce, but would definitely be interested in a recipe similar to this again. The double-use of the coconut milk was also a thumbs up. Next up we have the Chateau Wings! Now, before you start getting confused, they are not chicken wings, but a type of lean beef. I tried googling them, but didn’t get much feedback, so perhaps it’s an internal name they use to describe these hand-cut tenderloin portions. I was definitely excited for this meal, and you’ll soon see why! 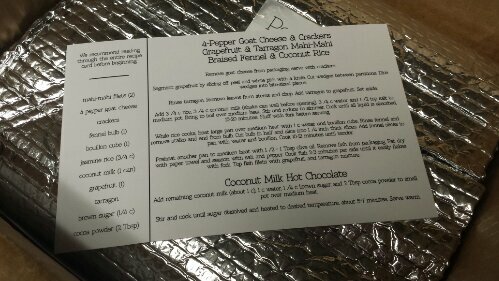 They included the recipe card, and I first skimmed through to get a feel of everything that had to be done. And like the previous recipe, I laid everything out for you to see, from spices to fruits to meat. 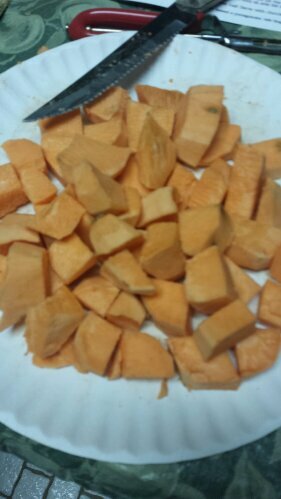 For timing reasons, I chose to begin boiling the water for the sweet potatoes first, and then opted to cut up the onions and sweet potatoes. 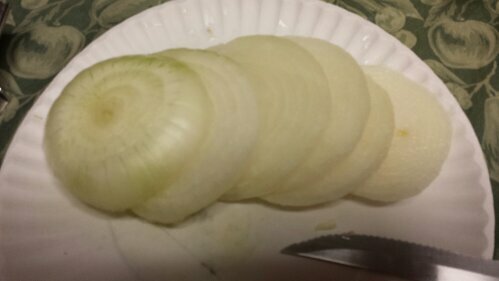 I cut the onions again, smaller than this, and began to sauté them in olive oil, while the sweet potatoes cooked in the boiling, salted water. 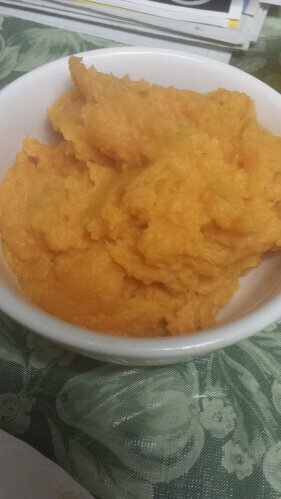 Once done, I strained the potatoes, returned to the pan, and mashed them up with the juice of the clementine, butter, some salt and pepper and a dash of cinnamon. I put the fresh bread into a 350 degree heated oven to warm up, and once the onions were mid-way to getting caramelized, I threw the chateau wings (beef) into a pan heated with oil, and dusted them with salt, pepper and the spice packet included in the bag. The spice packet was meant for the bread, to be dipped in oil and then spices, but I thought it would add something to the meat. After a few minutes, I flipped it and finished cooking to medium-well, and was ready for placement! I sliced up the warm, delicious bread and placed them to the sides of the dishes, and then began my pretty placement. 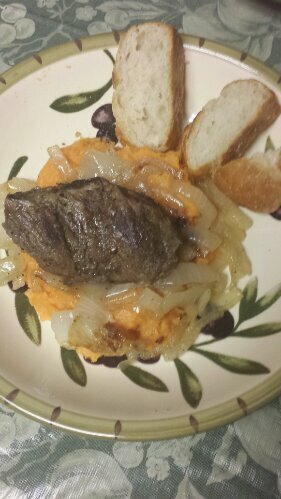 I started with the citrus mashed sweet potatoes, putting a nice heap onto the plate, and covered with the smothered caramelized onions, and topped it off with the perfectly cooked meat! I thought the sweet potatoes were GREAT. I never would have thought to add a citrus to them, but the clementine was a nice addition, as I often use maple syrup or brown sugar or another sweetener after cooking. For me, the onions was a go-to… I make them this way all the time, and love vidalia onions. I thought the chateau wings were also very good, however, like with the mahi-mahi, I often think meats and fishes need more seasoning to them. I would have dusted it with garlic powder, or marinated in a teriyaki sauce or another variation to give it more of a kick. I ended up using some Peter Luger’s Steak Sauce on top of mine. I also thought the roll was very tasty, and used some butter and seasoning on it, however I think it would have served better as an appetizer with some bruschetta or another tapenade on it. 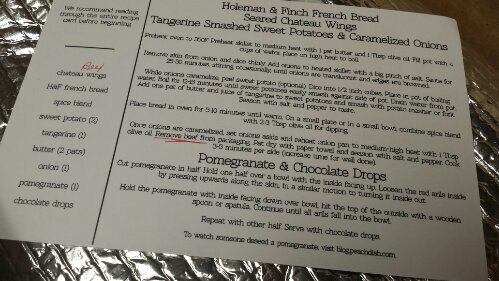 Like with the other dessert, I was STUFFED when it came to dessert time, and so I snacked on the pomegranate and chocolate at a later time. 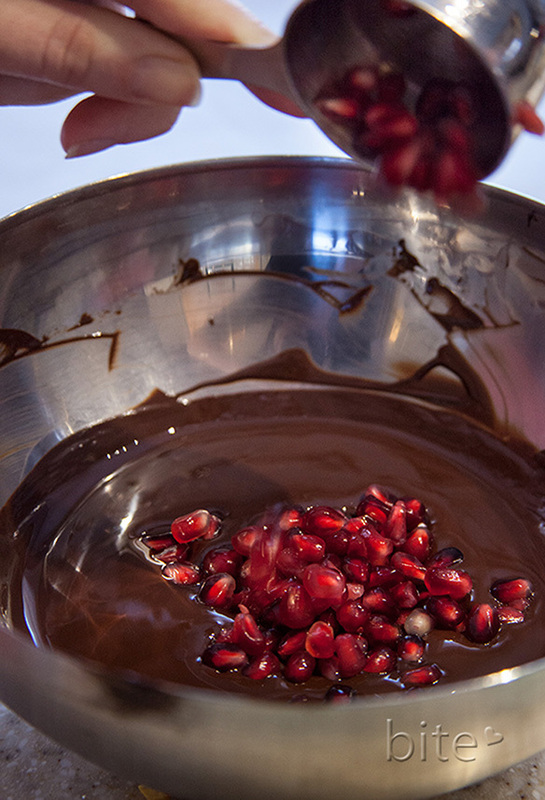 I decided to melt down the dark chocolate bits, and actually combined the pomegranate seeds and chocolate similar to this above picture (not taken by me) and made little pomegranate-chocolate bark pieces. I really enjoyed this PeachDish meal as it had a familiarity to my usual cooking style (sweet potatoes, caramelized onions) yet it added something new to the mix in terms of how it was flavored, and the type of meat cooked. I would definitely choose this recipe again, but would season the meat much more prior to cooking. The dessert was good too, but seemed odd eating the chocolate and pomegranates together, but worked well with melted chocolate. 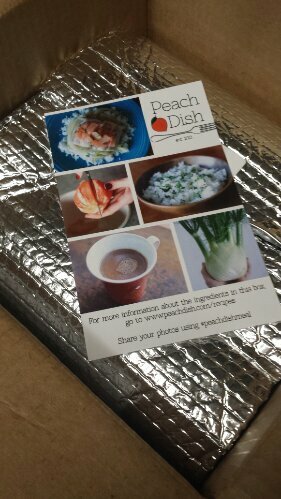 With the new changes such as revised menus and better shipping refrigeration, I would definitely recommend PeachDish to anyone interested in trying a fresh food/home cooking subscription service. You can see past menus here, like ones I’m dying to try such as the Teriyaki Salmon with Baked Brie and Cranberries, or the BBQ Chicken with Apple Slaw dinner. Once again though, I think they should begin to offer a vegetarian option to anyone who chooses or cannot eat meat and/or fish. Now that K is a pescatarian (i.e. a vegetarian who also eats fish/someone who won’t eat meat or poultry) I unfortunately could not eat the Chateau Wing dinner with him. What do you think about PeachDish? Use this link to sign up for e-mails, like on Facebook, etc and get $15 off your first purchase. I love the new meal service trend going on now. 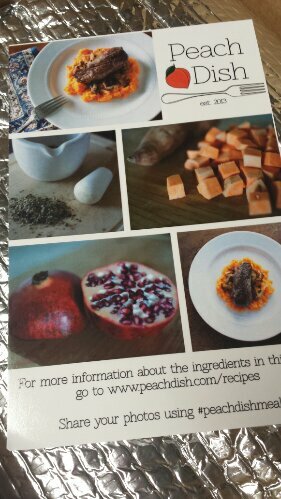 What I like about Peach Dish so far is that a lot of the dishes are pretty exotic and use flavor combinations you don’t typically find in your everyday life. I will have to give them a try because your dishes look scrumptious! I know, I’m always on the prowl for coupons and groupon deals! 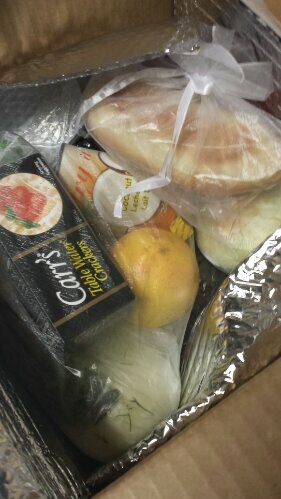 If I see any, I’ll be sure to post them… If you’re not a picky eater, these subs are so easy and convenient, plus PeachDish really improved from their first month or two of shipments. Everything was so good!